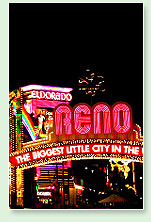 This popular Reno casino offers a total of three roulette tables. Each of these tables features the American roulette style which means there is the double zero. The minimums at these roulette tables start at $4 inside or outside (meaning you must place at least four dollars worth of chips on the inside and four dollars worth of chips on the outside or one or the other). The table maximum is set at $25 per number inside or $1000 outside. At the Circus Circus Hotel and Casino you will find a total of five roulette tables. The roulette tables are American style and there is a $10 minimum table bet inside or outside. The maximum is $25 for a straight up bet. Club Cal Neva has up to three open roulette tables which are all American style. The minimums start at $1 inside or outside and the maximum is $1000 for even money. This casino offers four different roulette tables, of which all feature the American style gaming. They enforce a $5 minimum bet inside and outside. Even money bets are limited to $1000 and inside bets are limited to $500 or $100 straight up. If you are looking for a European style casino, they are hard to come by. However, the Siena Hotel Spa and Casino offers one roulette table and is for a European style game. The table minimum is enforced at $1 with a maximum bet of $500 inside or outside.